About Us | Official Website of Extension Training Centre, Nongsder, Government of Meghalaya, India. The Ministry of Rural Development (MoRD), Government of India (GoI) institutionalized a three-tier process of training and capacity building for rural development on pyramidal basis i.e., the NIRD at the national level, the SIRDs at the state level and the ETCs at the regional and sub-state levels. The magnitude of people who requires capacity building and training at the block and village levels being so large, systematic training process is paramount to foster sustainable human development in an intensive manner particularly in the context of the importance being given to grassroots development and local self governance. Due to the increasing number of flagship programmes of MoRD in combination with other rural development programmes, the ETC has to take a more proactive role in imparting trainings and transfer of skills to a huge backlog of untrained people particularly those at the grassroot level. 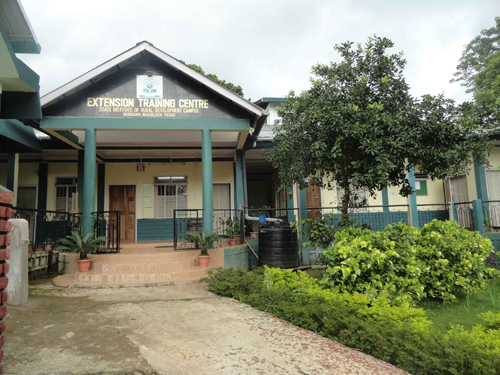 The ETC caters to the training needs of all block level extension officials, beneficiaries of Rural Development programmes and projects, NGOs, CBOs, AEC and VEC members, members of local institutions and all other block and village level organizations and workers. The ETC was established in the year 2001 and became fully functional in 2005 with the appointment of the senior most faculty member of SIRD as Principal followed by the appointment of faculty and staff. By an order of the Government of Meghalaya, the ETC has been declared as an autonomous organization duly registered as a Society on 16th January, 2012 as per provisions of the Meghalaya Societies Registration Act, XII of 1983 and under the administrative control of the Department of Community and Rural Development, Government of Meghalaya. The ETC is governed by the Governing Body and the Managing Committee notified by the Government of Meghalaya. The Members of the Governing Body, the Managing Committee and the Government authorities provide the leadership to the overall affairs of ETC. The principal is the overall in charge of the day to day affairs in the ETC with full administrative and financial powers within the approved budget. To provide a forum for training and other training related activities in the field of rural development and for exchange of views on training as a profession. To provide and exchange information on training techniques, methodology and materials, to establish and maintain libraries and disseminate information and to actively promote inter-institutional cooperation and collaboration in training between its members and other training institutions. To assist, promote and collaborate with individuals and organizations regarding development of training programmes as an integral part of continuing education for stakeholders in development process in various public systems. To promote greater integration and cooperation among individuals and organizations realizing the inter-disciplinary nature for rural development and the imperative need of such cooperation in the wider public interest. To do either alone or in conjunction with other organizations such other acts and undertake such other activities and to create such other structures, institutions and organizations as may be found incidental or conducive to the better realization of above listed objectives.